Try this Vanilla Frosting recipe with a blend of cream cheese, marshmallow creme and whipped topping. 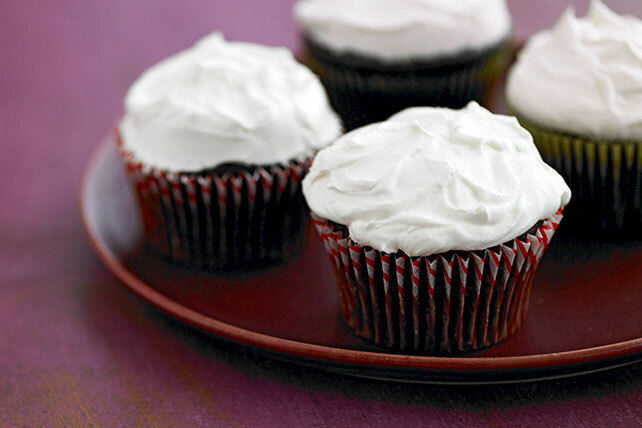 Add this vanilla frosting to cakes, cookies and more! Beat first 3 ingredients in large bowl with mixer until well blended. Add COOL WHIP; beat just until blended. Recipe makes enough to frost 24 cupcakes or to fill and frost one 2-layer cake. To pipe the frosting, spoon frosting into resealable plastic bag. Cut off small corner from bottom of bag, then use to pipe frosting onto the cake or cupcakes. Decorate frosted cupcakes or cake with chocolate or multi-colored sprinkles, colored sugar or nonpareils.